Asian stocks closed mostly mixed, while European shares have struggled for direction ahead of today’s high-level trade talks between the US and China. Global sentiment could receive a boost if there are any signs of the two sides finding a middle ground through trade negotiations. While another “no deal” scenario has the potential to negatively impact risk appetite, ongoing talks between the US and China could continue to soothe concerns of a potential global trade war. Heightened market expectations of higher US interest rates this year have ensured Dollar strength remains a dominant market theme. The combination of positive domestic economic data, rising US bond yields and speculation of higher rates have elevated the Dollar to its strongest levels in five months. Price action suggests that bulls are clearly back in town, with further upside on the cards as the interest rate differentials continue to favour King Dollar. Focusing on the technical picture, the Dollar Index is firmly bullish on the daily charts, as there have been consistently higher highs and higher lows. A breakout above 93.50 could encourage an incline higher towards 94.00 and 94.20, respectively. Alternatively, a failure for bulls to keep prices above 93.50 could encourage a decline towards 93.00. 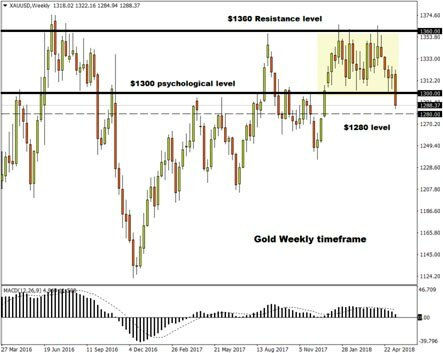 After over four months bouncing within a wide $60 range, Gold has finally broken below the $1300 psychological support level this week. The primary culprit behind Gold’s steep decline could be growing expectations over the Federal Reserve potentially raising US interest rates four times this year. An aggressively appreciating Dollar has also left Gold vulnerable to steep losses, with prices sinking towards a fresh yearly low at $1285 as of writing. With appetite for the zero-yielding metal at risk of eroding in a high-interest rate environment, further losses could be on the cards. Taking a look at the technical picture, bears won the tug of war following the breakdown and daily close below the $1300 support level. Previous support could transform into a dynamic resistance that encourages a decline towards $1280. The Euro has been hammered by political uncertainty in Italy while a strengthening Dollar continues to rub salt inthe wound. This has been an incredibly bearish trading week for the EURUSD, which dipped to a fresh 2018 low of 1.1763on Wednesday. 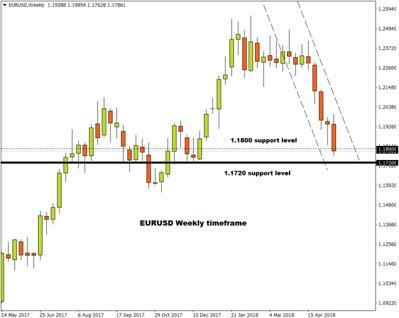 Taking a look at the technical picture, the EURUSD fulfils the prerequisites of a bearish trend, as there have been consistently lower lows and lower highs. Previous support around 1.1800 could transform into a dynamic resistance that encourages a decline towards 1.1720.